Welcome to the Porter County Retired Teachers Association (PCRTA) website. We are an organized group of retired educators who taught or live in Porter County, Indiana. Any retired teacher, administrator, or surviving spouse who is receiving a pension from the Indiana Teachers Retirement Fund may become a member of PCRTA by payment of the annual dues. Anyone may join as an associate member. Visit our MEMBERSHIP page for additional information. 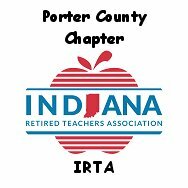 Strongly encourage membership in the Indiana Retired Teachers Association (IRTA), which is our primary lobbying presence in the State Legislature.